A Muslim free school in Derby is expected to be rated as inadequate in all areas, the BBC understands. 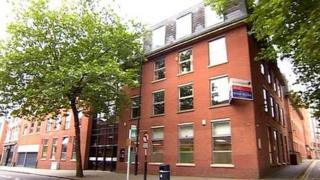 The Al-Madinah school closed on Tuesday after one day of an Ofsted inspection over "health and safety concerns". Sources said this was due to incomplete records of child protection checks being done on all staff. The school said it will reopen on Monday. While the Ofsted report has not been finalised, preliminary findings have given it the lowest possible rating. Opened in September 2012, Al-Madinah school claimed to be the first Muslim ethos, all-through (reception, primary and secondary) free school in the country. But persistent concerns over the application of strict Islamic practices led to a scheduled full inspection being brought forward. On Wednesday, it emerged unnamed female staff members claimed they had been forced to wear headscarves and alleged girls were made to sit at the back of the classroom. The interim principal, Stuart Wilson, has said he had not received any complaints from colleagues regarding the dress code, which was made clear to all staff and applicants. He also denied pupils had been segregated. In a statement on the school's website, posted on Friday, Mr Wilson said the school would reopen on 7 October. "While it was regrettable that the school had to close at all, the well-being of our pupils will always be our first concern," he said. "Unsurprisingly, there has been a number of rumours circulating. While unfortunate, my decision to close the school related to a short-term health and safety issue that has now been completely resolved and will not reoccur." He said they would await the full findings of the Ofsted report which he expected to be published "in the next few weeks". Regional Officer for the National Union of Teachers, Nick Raine, said they only had a handful of members in the school but all had complained about various issues at Al-Madinah. "There were concerns about some of the things going on in the classroom, concerns about the quality of the education the children were getting," he said. "Our members are very concerned about children as a whole and obviously took this job thinking it was a new and exciting school. "We did say, being a free school, it's a completely different paradigm and we are very worried this is going to be run out across the country. "It's an experiment on our children's education." Separately, inspectors from the Education Funding Agency have also been at the school, looking at allegations of financial irregularities around the awarding of contracts.